Julie is our Hostess with the Mostess and she always has a fun "technique" challenge. This time it's pretty broad and easy, so I don't expect any hesitation from ya'll in your playing along. 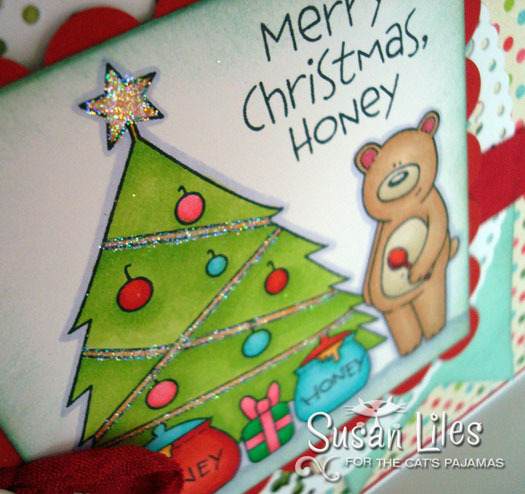 Just create shiny embellishments for your holiday card. Use glitter, glossy accents or whatevs! Yooooo can doooo it!!! I used the new set, Merry Christmas Honey. For my shiny embellishment, I used Dazzling Diamonds from SU! on the garland and star. Super sparka-lay in real life. I also layered a Snowflake Lace Paper doily back behind the main image panel and finished the card off with some Cranberry Seam Binding Ribbon (crinkled with a little water and dried with my heat gun) and Christmas Divine Twine. Swoon....!!!! Ok, I've got to go and get some more lights for our Christmas tree. Eight strands is NOT enough and since 2 other strands aren't working, I have to grab a couple more for Eric to finish them up tonight. That will make Day 3 of just decorating the Christmas tree! Ack! It's a big tree. Ok, ya'll's next stop on the hop is the talented and oh-so-fabulous Jen!! Be sure and give her some special love--she's had a rough week with a sick kiddo! BUT FIRST, SPECIAL NEWS: As a Christmas gift to ya'll and the last sale of the year, The Cat's Pajamas will be offering 15% off your entire purchase until the end of November. That INCLUDES a discount off the already discounted price of the Kitty Kat Pack and the Poochie Pack. Just use Promo Code Happy15. Merry Christmas! 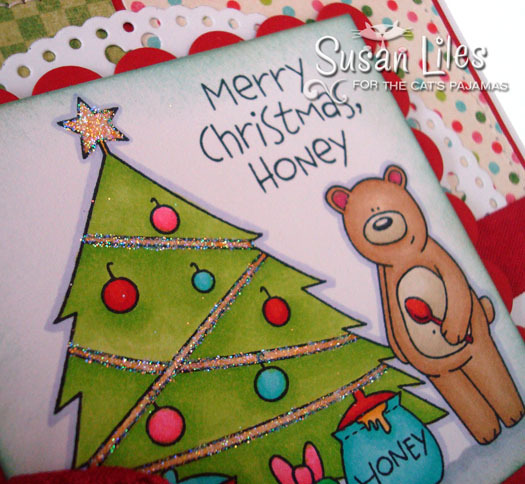 SUSIE Q-TIP: Notice there is no separate sentiment panel on this card. Stamp it directly onto the main image panel for a change and to make your life easy. How cute is this? I love all the sparkley goodness and the coloring is awesome. This is super cute! Love the lil' bear stamp! This card is such a fun one Susie! This furry fella is feeling beary festive isn't he! :) I love your gold glittery strands and star atop that fabulous tree! Thanks for all of your wonderful inspiration throughout sneak peek week, each and every creation you make is so very beautiful! Love the sparkle--and the crinkly seam binding, too!